Okay, how about this. If the site goes down during E3, all of the mods have to change their tag to "Owned by E3". If the site stays up to E3, all the members in the site have their tags changed to "Owned by ResetEra". Augh! Those colors are too bright for extended browsing, my eyes! DarkEra still looks fantastic on my end, at least. I tried clearing cookies and data too. First off, please hear me out. I think have begged for some time for certain usability features or being allowed to implement the opion myself. I am a very long time member and passionate about usability. I am not meaning to dismiss the hard work everyone has done. Unfortunately the night version blue color is almost physically painful to my eyes still, to the point that I cannot use that version purely because of that. I suppose I could look into scripting to mod the colors. I very strongly beg for an option to turn the colors gray, red, orange, or basically any other option but blue/purple. There has even been recent academic research about blue light and sleep patterns/cancer. If I'm not mistaken, that color more than any other tends to wake up the brain and affect sleep patterns, which seems exactly the opposite of the desired effect of a night mode. As it stands, I'm grateful the old modes are still available, since the only change I want there is a script/option to let the thread title jump to the latest post, allowing me to avoid RSI risk as a right hand person. I respectfully offer to implement such an option if allowed. I just need the margins from NightEra over on Day. Still massive margins on PC. And on mobile, still massive margins on the sides of avatars. Great update! But till thats fixed I'll stick with DarkEra. edit: There is still way less actual room for the posts on mobile, so you have to scroll way more. The keyboard auto-correct in posts can get a bit wonky at times. Is that specific to something in era that has to be changed or something bigger? I feel like there was a thread about it before but I can't remember the details of it. I tried hiding avatars and img on mobile (cleared cookies/cache etc.) but for some reason they show up. Anyone else experiencing this? Anything on the force log out issues while using the old themes? 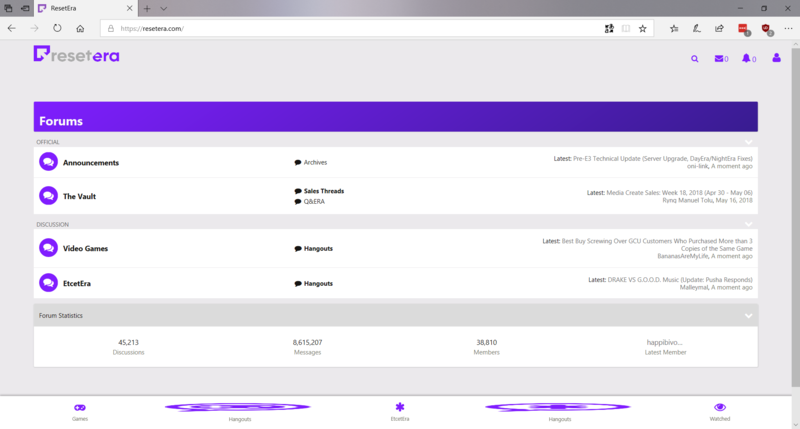 How does ResetEra operate? Are ResetEra staff based in an office or something? Or does everyone just communicate online? Did... did you just complain that Era might be giving you cancer? NightEra is perfect on my OP6 now. Browsing this forum is a joy thanks to this. I think I can get used to new night era now. Why that shade of purple still though? I like the color scheme of the dark era more. Also not a fan of gradients. Hm. I got excited, but then I noticed that the purple is still seemingly the same as before. If it changed, it must have been extremely subtle. It's still too oversaturated compared to the nice pale shade of purple that we had in DarkEra. If you click this button, it should hide them. You can also fill in a machine name, for it to do it just there. It doesn't apply until a name is in the field. The light theme is still completely broken on my phone. Well, all the themes are broken, the light theme is just the worst because of the excessive margins. Hooray! I welcome the update. As Conkerkid11 said, is there a possibility of getting the color scheme of Dark Era for Night Era? Thank you, you're a lifesaver. Has the purple been changed at all? It still looks about as bright as it was before, maybe this is a bug? Woah didn't even know we had new themes. NightERA looks great! The side bars will take some getting used to, but still. EDIT: Mobile NightERA is amazing! I don’t see how this is a fix for the night era color at all, it’s still waaaayyyy too harsh. Why not use the normal dark era colors? I don’t get it, doesn’t look like it changed at all. I’m genuinely confused by the decision to change to this bright purple. If memory serves me it is an issue caused by certain keyboards that have swipe typing. As far as I know SwiftKey is the only one who currently has patched the issue. I swapped over to them a few months ago. None of the others have fixed it so far. This is a problem with the actual keyboard code and the browser, not with ResetEra. So I'd recommend swapping to SwiftKey to fix that problem. All text entered in the reply field at the bottom of the screen is bold. That wasn't happening before. Yes! Thanks for the YouTube fullscreen problem! Yeah, NightEra is way more usable now thanks to the change in colour. I'll leave it on and see if I can adjust. That's the extreme case the research correlated with areas that had lots of outdoor blue light, off the top of my head. Go search my thousands of posts on here or GAF if you feel I might be any sort of conspiracy theorist. I was afraid I might need to clarify so I'll go ahead and do that: I'm not saying a single smartphone is giving anyone cancer. I do think that blue colors are painful to my eyes in the theme and some of the worst options for night vision and affecting sleep schedules (melatonin). I can dig up information if I must (see https://uxdesign.cc/dark-or-light-ui-the-ux-influence-ca6df6aff390 for example). Red colors are used universally for night vision as far as I'm aware, and even in website night themes reddish or grayish colors can be less painful than a large solid bar of blue as in Night Era. Yeah, NightEra is much improved. I think the thread titles are still a bit too bright but within the thread things are much more readable. Good stuff! I think I'll stick with Dark. Night has too much empty space and the color's still too bright. I mean it looks better, but DarkEra is still my preferred. NightEra just hurts the eyes, it has cool features... but not worth switching from DarkEra. Can you guys please make NightEra colours more like DarkEra? That bright colour ruins NightEra for me. I'm.on dark theme legacy and the site looks quite different (and so much better) compared to the screenshots I see here.. (first page anyway). I don't have those buttons along the bottom but I prefer without thanks very much. Weird how it looks so different to you guys. On a Pixel 2 and the site under dark legacy is perfect. Colors are a pinch bright, but not nearly as bad as before. Works wonderfully on my tablet. 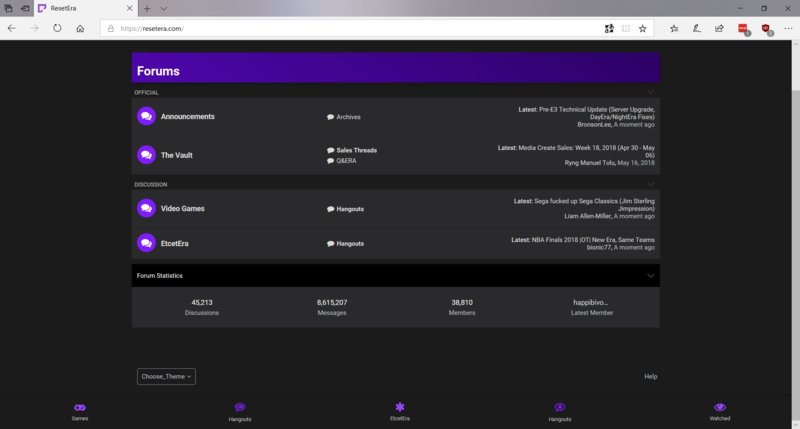 I can adjust to the margins but the purple is eye melting for some reason on the dark theme. The old purple was great. Night Era looks much better and I'm glad the servers won't be melted during E3. Cerium Why the huge margins everywhere? I'd also appreciate if DayEra could have a less neon purple color. I've never understood the NightEra complaints, and I've used it since day 1. Hopefully this update makes it just as pleasent to everyone else. And I'm ready for ERA servers VS E3.